Monte Cook Games kindly provided a copy of the “Torment: Tides of Numenera The Explorer’s Guide” before its official release and this is my review. 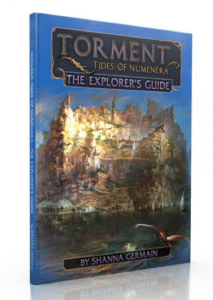 Before continuing I must mention that this book is a supplement for the Numenera tabletop role-playing game. It does not contain any walk-through or hints regarding the upcoming video game, though it contains spoilers for some elements of the video game plot. You are warned. Now that I have scared off all the video gamers I will continue with the review. When I review RPG products, I look for things like editing, concise writing and theme. Finally, I look at construction, layout and art. 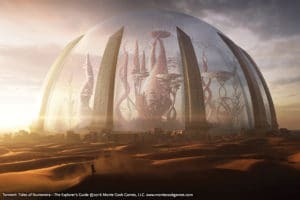 The Explorer’s Guide covers “Greater Garravia” which is East of the “Clock of Kala.” Essentially it is off the Ninth World map in the base Numenera book. This is entirely new material to the campaign and there is much quality content to be had. Starting with an odd, but interesting optional rules mechanic. Tides. Essentially “Tides” are invisible, intangible aspects of your decisions that influence the world around you in subtle ways. So an aggressive, violent fighter might gain an affinity to the “Red” tide. As you fight your way through problems you become more aligned with the Red Tide. In terms of rules, there is a point tracking system for this mechanic, but it is more flavor that benefit. In this example, the DM might say that your reputation proceeded you into a new town as a canny fighter because of your Red Tide affinity. It is local to this region and I suspect it is a mechanic in the video game that ported into the RPG. Still, it is fun that a mysterious collective sub-conscience is influencing the world. Should make for some interesting RPG opportunities. “M’ra Jolios” brought a smile to my face as the author put the standard “underwater kingdom run by fish people” in the middle of the desert! Trope busted! “M’ra Jolios” has the usual assortment of mer-people, mysterious gods and an ongoing insurgency. The Ghibra (mer-folk that run the city) actively discriminate against air breathers, so blood floats through the cities broad avenues as the underclass takes up arms. Other than the ongoing war and being surrounded by a insanity inducing desert, M’ra Jolios is a wonderful place to visit. While “Bloom” inspires thoughts of beautiful flowers, it is more like a carnivorous fungus masquerading as a city. Behold! A vast, living entity “The Bloom” is a warren of tunnels, caverns and hungry maws inhabited by the either the desperate or the adventurous. The life form that makes up the city emits chemicals and psychic interference that slowly drive people mad. Even worse, it will try to eat people at random unless they take counter-measures. There is no sane reason to live here, except for the maws. Maws are exactly that, giant hungry mouths that need feeding. Now, you can offer yourself up as a snack (or someone else, voluntary or not. The Bloom is not a picky eater) and the maw takes what it wills. It could be a treasured memory, your sense of taste or a limb or two. Truly unlucky offerings become a snack and are dragged away for further digestion. Once satiated, a maw opens offering a path to another location, time or perhaps another dimension. 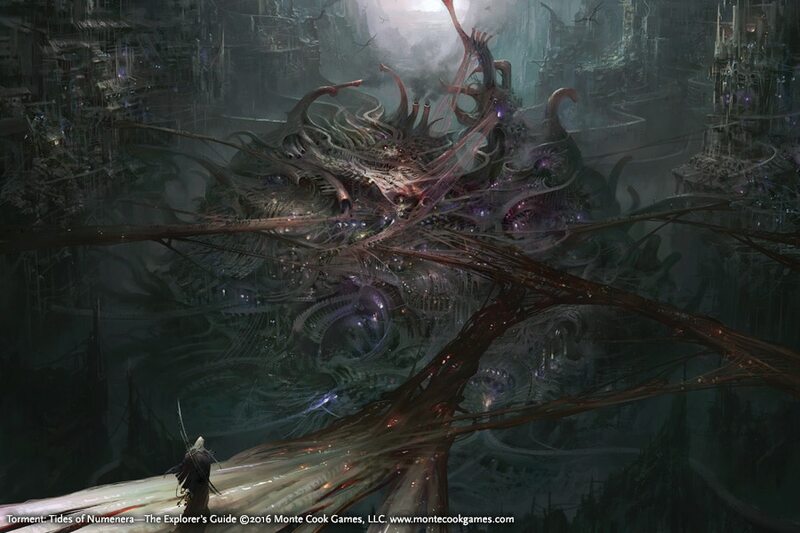 There is money and adventure within the maws and this potential brings an endless supply of both adventurers and the desperate to The Bloom. I like this book and will inflict its weirdness on my players in the very near future. The new locations and NPCs are clever creations (including a god that swaps bodies and the leftover bodies wreak havoc on the world and rivers that hardens during the day and turns to liquid at night.) The editing and layout are top notch as is the art (see above). This book will be released in a couple of weeks and pre-order pick-ups at Gen Con 2016 are available.